If you have any questions or suggestions you are welcome to join our forum discussion about Detrended Price Oscillator. The Detrended Price Oscillator is an indicator which is designed to remove the trend from a price by comparing the price to a prior moving average, thus filtering out cycles longer than the moving average. It identifies cycles’ highs and lows and estimates their length from peak to peak and trough to trough. This allows the trader to determine more reliably overbought and oversold areas. Price (X/2 + 1) periods ago minus the X-period Simple Moving Average. Thus, a 20-day Detrended Price Oscillator that uses a 30-day SMA will be displaced by 30/2 + 1, or 16 days. This will move the 30-day SMA by 16 days to the left of your chart into the middle of the lookback period, centering it. The value of the 30-day SMA is then subtracted from the price in the middle of the trackback period, thus the DPO (30) equals the price 16 days ago minus the 30-day SMA. The screenshot below illustrates how a DPO is plotted in a trading software. The indicator’s cycles are created as it is displaced back in time. Because of that, it is not a real-time indicator and is used only to mark historical highs and lows, which traders can use as an entry point but based on trading strategies which include additional indicators. The DPO oscillates beneath/above zero as prices move below or above the displaced moving average. There are several ways its readings can be interpreted and used. A trader can go long or short when the Detrended Price Oscillator crosses into positive or negative territory, respectively, and thus follow the trend. You should go long when the DPO falls below zero, shifts direction and edges back up to positive values. Conversely, go short when the market crosses above zero, reverses and plunges back into negative territory. The DPO can also signal whether the market is in an overbought or oversold condition, which signals a possible upcoming reversal and is used to trade in ranging markets. You need to set overbought and oversold levels based on past observations over market movement. Go long when the DPO enters the oversold area, reverses and crosses back above it. Go short when the DPO becomes overbought, shifts direction and edges lower out of the overbought zone. 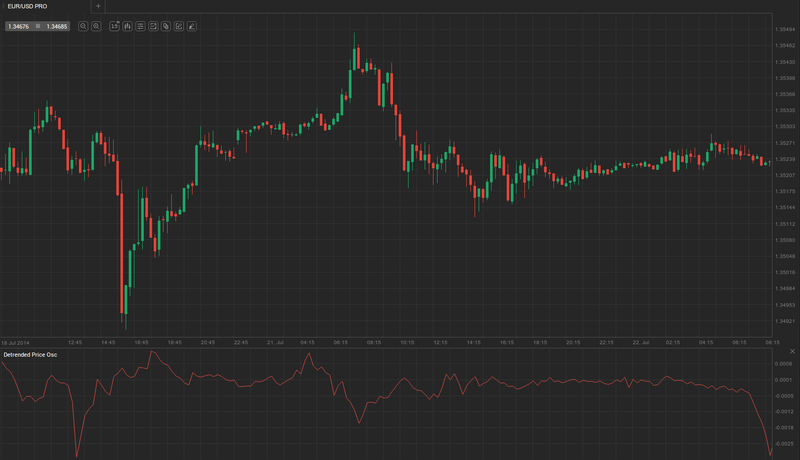 Some traders also trade the divergence between the price and the DPO – a bullish divergence occurs when the price marks a lower low, while the DPO falls to only a higher low. Conversely, a bearish divergence is at hand when the price rises to a higher high, while the DPO reaches a lower high.